U.S. Supreme Court won’t hear Vinod Khosla’s case, which means coastal access at Martins Beach remains intact. WASHINGTON, D.C. — Happiness isn’t a tangible item you can buy at a brick-and-mortar store or on some e-commerce website – which feeds the eternal discussion of whether a happy state of mind can be acquired for the right price. Silicon Valley entrepreneur and billionaire Vinod Khosla, however, found out the piles upon piles of cash resting in the depths of his bottomless pockets could not buy him his own stretch of beach in Central California. The U.S. Supreme Court, on Oct. 1, rejected Khosla’s appeal to maintain control over a public stretch of waterfront at Martins Beach, a small coastal enclave about one hour south of San Francisco. Attorneys for Khosla argued the venture capitalist’s Fifth Amendment rights were violated. Governmental agencies, in seeking to provide coastal access to the public, illegally seized his property, Khosla’s legal team argued. 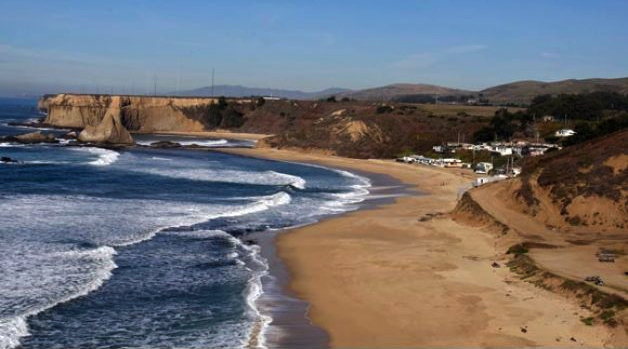 Khosla’s legal loss means he will have to allow the public access to a stretch of beach connected to property he owns just outside of Half Moon Bay in San Mateo County. A portion of Martins Beach has to be accessed by a path running through Khosla’s property. Khosla, a ventura capitalist, sought to have the path blocked (via locked gates), thereby restricting the public’s access to the beach. Decisions by the Supreme Court cannot be appealed; the Oct. 1 rejection of Khosla’s case, accordingly, is final. The venture capitalist reportedly stated he would still pursue his legal claims, despite the Supreme Court’s rejection of appeal. Public access to Martins Beach through Khosla’s land had been unfettered for decades until Khosla shut down the pathway when he bought the property in 2008. He had been embroiled in a legal battle ever since, with the venture capitalist defending his claims of takings violations. At one point he reportedly said he’d be more than happy to allow the public to access Martins Beach through his property. Such access – and happiness – however, came with a demand for millions of dollars. Khosla, according to news reports, spent more than $30 million for the beachfront property. California’s Coastal Act and Constitution both guarantee public access to beaches and waterways, as a matter of right. The billionaire maintained his legal claims throughout a long and arduous court battle, but was unable to convince the highest court in California his property interests trumped the public right to coastal access. Coastal access had indeed been the central issue of Khosla’s case. Public access to beaches as a birthright in California would have been jeopardized had Khosla’s attorneys convinced the U.S. Supreme Court to side with him. The Log regularly reported on the Martins Beach legal saga, stating the final result of the process could have implications on coastal access for boaters, kayakers, surfers and beachgoers alike. In the end it was the Surfider Foundation and others fighting to maintain unfettered public access to the coast who celebrated the Supreme Court’s rejection of Khosla’s case. “We celebrate a hard-fought win based on California law that, once again, has proven to protect our treasured natural resources, and access to them, for every man, woman and child who heads to the beach in the ‘pursuit of happiness’ afforded by our nation’s laws and to ‘maximize public recreational opportunities in the coastal zone” as afforded by our state Coastal Act,’” a Surfrider Foundation statement published after the Supreme Court’s rejection stated. The Supreme Court’s rejection of Khosla’s appeal does not necessarily mean the venture capitalist is entirely out of options. Khosla could still seek a permit to alter the public’s access to Martins Beach, a Surfrider Foundation statement said. The public, however, can freely access Martins Beach through Khosla’s property in the meantime. “This means the road to the beach must remain unlocked and open to the public until property owner billionaire, Vinod Khosla, applies for and obtains a permit to change access,” Surfrider Foundation staff said in a released statement.